Let’s face it good health seems harder as you get older, but the key to aging well isn’t solely in your physical health. In fact, a MacArthur Foundation study found that 70 percent of physical aging and approximately 50 percent of mental aging is determined by our everyday lifestyle choices. Makes sense right? But where do you begin? At Sonata Senior Living we say Live it Up!SM And it’s more than just motivation to enjoy life, Live it Up is a proprietary wellness program developed exclusively for Sonata residents. 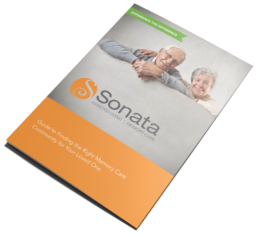 Sonata Senior Living has taken this framework and integrated it with the latest research in active aging and wellness, along with the most current equipment, training tools and resources to create our Live it Up! program. How We Live it Up! Emotional – Through peer counseling, stress management, laughter and personal histories, we enable you to cope with challenges and manage emotions. 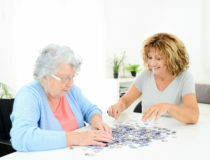 Intellectual – We offer creative and intellectually stimulating activities in all our communities as well as Teepa Snow’s Positive Approach™ to Care in memory care to empower continued engagement through tasks, by focusing on remaining abilities and by integrating your preferences into daily life. Physical – Our licensed nurses, supplemental care and personalized services help you improve health and functional ability by supporting physical activity, healthy eating and medical recommendations. 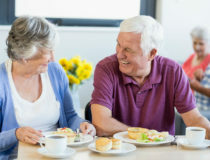 Vocational – We make it a point to learn the unique and varying backgrounds of our residents so that we can promote engagement and purpose in your daily life. Social – Because visiting with neighbors, friends and loved ones, celebrating special occasions, friendly card games, museum visits and pool parties are all valuable to maintaining health, we offer a range of opportunities for you to socialize on and off campus. Spiritual – Whether it’s personal meditation, mindful exercise, feeling one with nature or spiritual wellness through religion with group and individual faith-based activities, you’ll find a range of opportunities to find purpose and connection. Environmental – By emphasizing natural light, universal design, safety innovations and outdoor recreation areas, our purpose-built communities enliven and enable an environmentally conscious atmosphere. Our approach to senior living has earned us national recognition as an innovative leader with evidence-based design and programming. But it’s also an approach that helps our seniors live their best life and that’s what truly matters most to all of us. For more information on Sonata’s senior living communities in Florida and our proprietary Live it Up! program, call a community near you today to schedule a visit.